JJ Spa on Washington Ave. in St. Martin was raided today by the Jackson County Sheriff’s Department, District Attorney Tony Lawrence, and federal law enforcement agencies on allegations of prostitution and human trafficking. Doug Walker with WLOX reports this is as a result of year long investigation. The spa rents space from Eagle Express, LLC and is located in Eagle Plaza. Eagle Express is owned by former SRHS trustee Morris Strickland. Alleged prostitution activity at the location has been documented on several online review sites where customers rated the women, discussed specific acts, and compared prices. The business was open into the early morning hours.Customers also discussed the rotation of women between different states and locations. 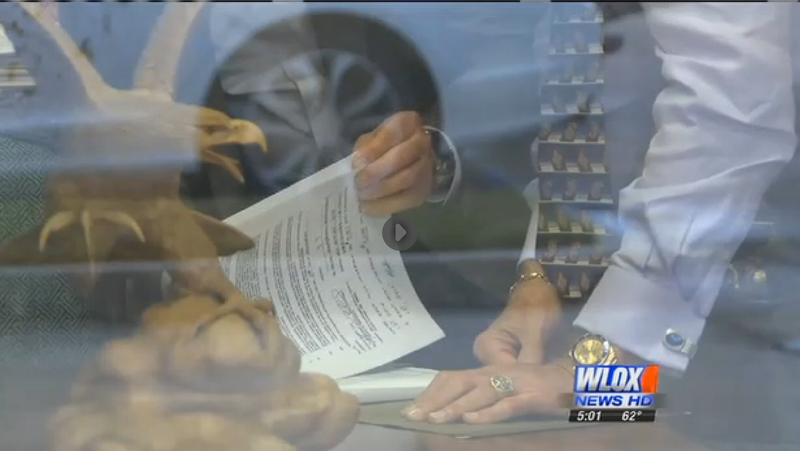 WLOX appears to have captured Mr. Strickland reviewing lease documents. Note the eagle sculpture and jewelry that Mr. Strickland is fond of wearing.